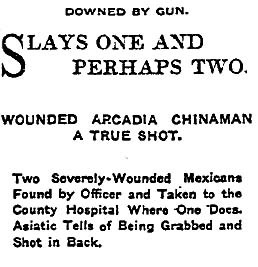 Badly wounded, Ramirez and Palamoratz struggled to walk about a mile to a friend’s house in a small settlement near the Baldwin store in Santa Anita, leaving a trail of blood along the railway tracks through Baldwin’s vineyard. Arcadia Marshal O.C. 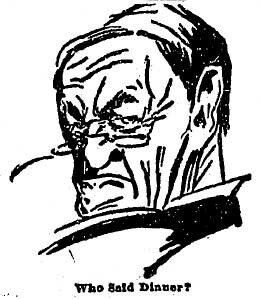 “ Jack” Berdie, upon learning that Chew had been shot, visited him, dressed his wounds and questioned him about the attack. Chew said it was so dark when he was ambushed that he couldn’t see how badly he had wounded Ramirez and Palamoratz. Bertie finally found the men and took them to the county hospital, where Ramirez died and Palamoratz was in critical condition. The Times never published any further stories about the incident, leaving us to wonder about ethnic feuds on Baldwin’s ranch. By 1914, Berdie had given up his post as Arcadia marshal and was working as a bailiff in downtown Los Angeles. It is difficult to believe that “Palamoratz” is a correct spelling, but California death records are completely unhelpful in locating that spelling or anything more typical, like Palomares. And in the continuing story of the Mexican revolutionaries, authorities are taking extreme precautions to prevent an escape attempt aided by the crowds surrounding the men during the daily walks to and from court. Due to fears of an attempted rescue, officials now require people entering the courthouse to state their purpose and sympathizers of the revolutionaries are barred from the corridor outside the courtroom, The Times says.